Small London gardens have been a major source of interest and pleasure to me over much of my life and I have enjoyed designing a great many of them. The brief was almost always the same; all year-round interest, low maintenance, flowers, somewhere for outside entertaining and for children to play (often including the hateful trampoline which in several gardens I managed to bury – but not with the children underneath). Most recently the technological innovation of sliding walls of glass has created indoor space that flows outside, but also the need for the garden to become more like a stage set. My designs increasingly became a pared-back minimalist style, and although I found the small domestic Japanese garden incredibly stylish and a source of inspiration, I never really understood the thinking behind it. On my recent trip to Japan I was excited to be able to see the Nishikawake House, a rare surviving example of a traditional merchant’s house, situated in the small historical town of Omi Hachiman about forty miles from Kyoto. 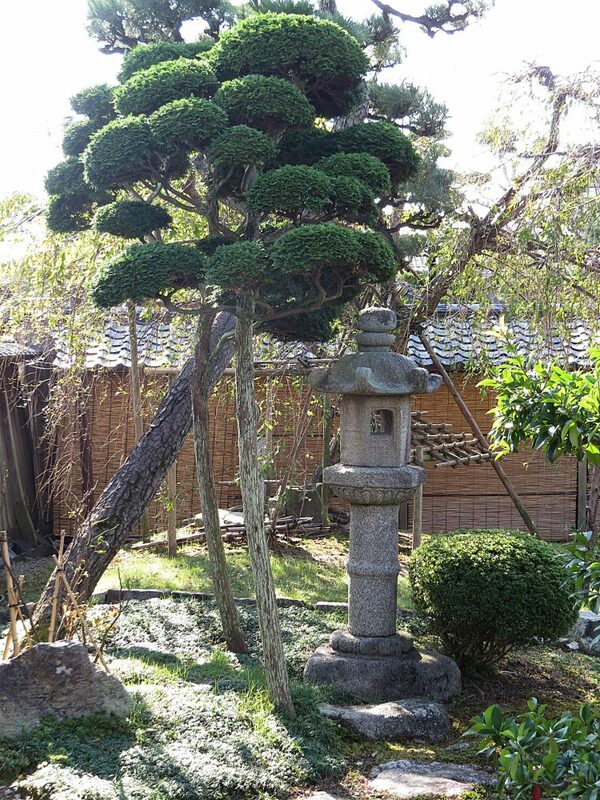 The profound difference between the small British and the small Japanese garden is that in the former the garden is viewed as attractive usable space whereas in the latter it is considered a living work of art based on Zen Buddhist philosophy; the flow of space being visual rather than practical. During the Edo period (1600-1867) prosperous Japanese merchants began building small gardens behind their houses, designed with carefully composed views and no single feature acting as a focal point. The garden when seen from inside the house was part of an enticing flow of space, the viewer being at its centre. 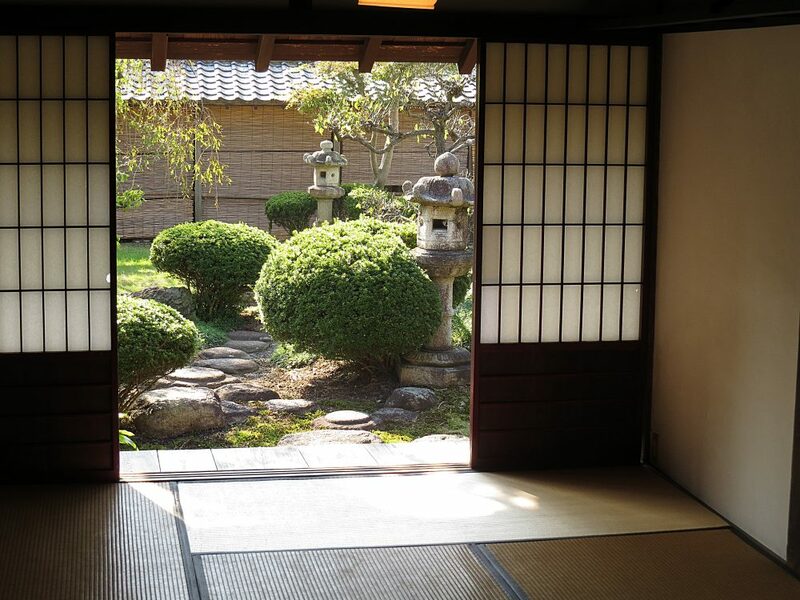 The sliding door, window and room dividers made from translucent paper on wooden frames (shoji) both hid and revealed garden views so that unlike most of our Western gardens there was a subtle element of anticipation. Most of these tiny traditional gardens were not meant to be entered, and features were carefully considered and placed, including stone lanterns, water basins, stepping stones, and screeds of pebbles and small stones. A limited palette of plants and trees was chosen; azaleas clipped into balls (thus removing most of the flower buds), camellias (often trimmed as hedging), bamboo, Japanese acers, and cloud-pruned pine. 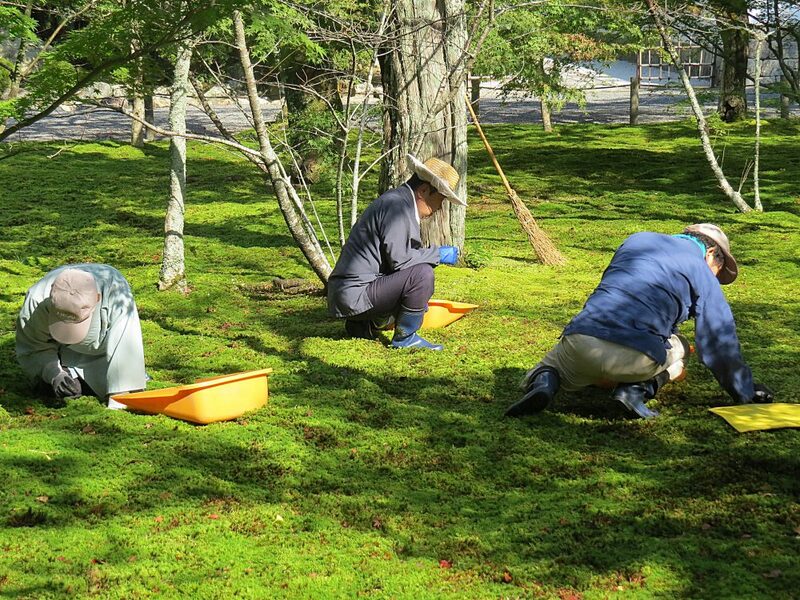 Moss was often used as ground cover, with patches of ophipogon japonicus (a small neat perennial that looks like a coarse grass turf), whilst garden boundaries were either rendered and painted white walls, over a stone footing and with a tiled coping, or were fences of bamboo or a mixture of bamboo and reed. This type of garden is deceptively high maintenance as it strives for aesthetic perfection. Shoots have to be pinched out of the cloud-pruned trees, shrubs clipped and moss weeded, and being such a precise work of art, gravel carefully raked, and leaves either swept up or artfully scattered. Although Japan has four distinct seasons, the gardens change little through the year, flower playing a secondary role to foliage; however cherry blossom time has a special place in Japanese culture and philosophy representing the impermanence of creation and the unstoppable advance of time. The late 17th century Nishikawa House, situated on a spectacular street of conserved houses from a similar period, is so named because it belonged to Nishikawa Riemon, a wealthy merchant who sold futons and mosquito netting. Whilst the entrance to the shop is on the street, the house and garden are approached up a narrow path of gravel and stone pavers at the side. 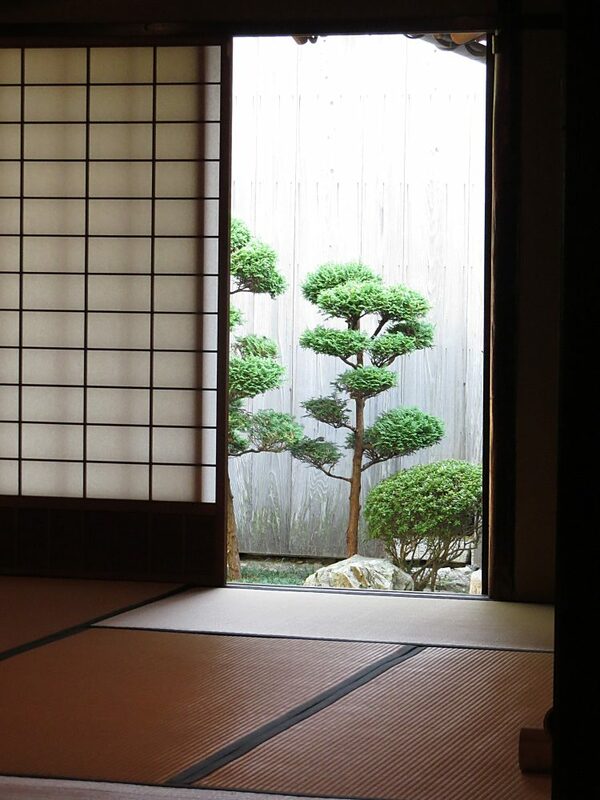 As is typical of traditional Japanese houses the interior is sparse and minimal and the room size dictated by the size of the tatami (the rice straw mats edged in material). Decoration consists of strategically placed ikebana displays (minimalist flower arrangements), and wall-hung scrolls. 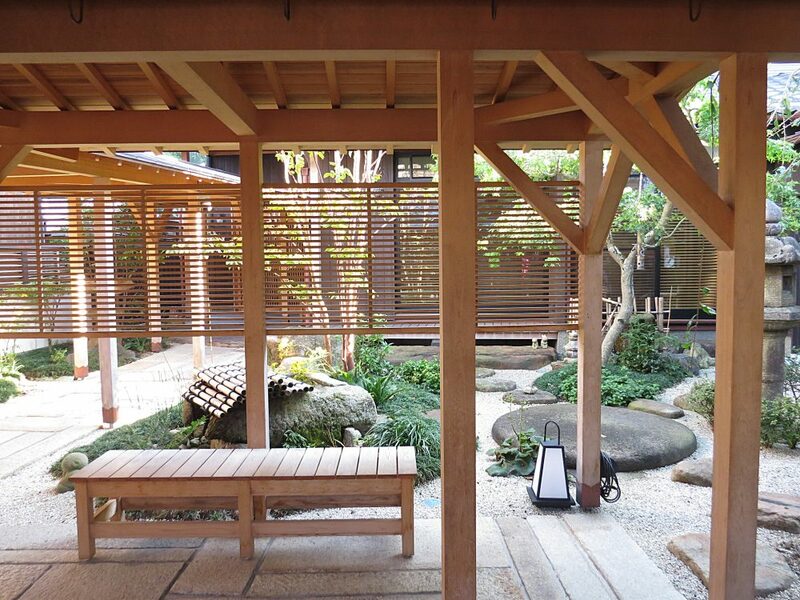 I was pleased to see that this garden tradition lives on in Omi Hachiman, and to view the garden to a contemporary house that had both a modern feel and traditional features such as a stone lanterns, although it seemed to lack the spirituality of its forebearers. 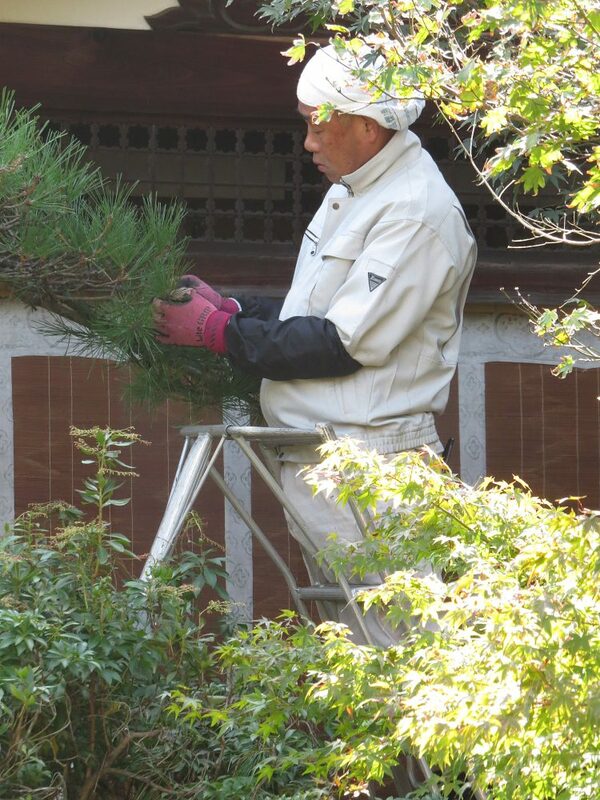 The trip to NishIkama House and the delightful small town of Omi Hachiman was one of the most memorable of my stay, and a different experience from visiting the great and famous gardens, and I gained valuable insights in a field that is of particular interest to me making it a very satisfying and worthwhile visit.